Your Winery Deserves Perfectly Designed Reusable Wine Bags…Here’s How to Create Them without Busting the Budget! The wine you create is a labor of love. The bags you offer to your customers to carry your wine home or to friends and family gatherings should be a reflection of your work and work to effectively market your winery. Reusable wine bags are fantastic marketing tools for wineries because they not only are utilitarian, they also work to spread your branding message, deliver a great ROI, and help reduce plastic pollution on our planet. Since you have a special product, the wine you work so hard to perfect, you should give your customers a perfect bag in which to carry your bottled wine. Here’s how to create completely custom reusable wine bags that your customers will love and use again and again. The easiest way to create the perfect reusable wine bags for your winery is to ditch the everyday, run-of-the-mill wine bags and go totally custom. To create full custom bags, you need to find a manufacturer who has the capabilities to do this. When you order custom reusable wine bags from us, you have two options. You can order from our stock selection, which offers a quick turnaround, typically up to 4 weeks, and lower minimum order quantities. Ordering stock bags allows you to choose from existing bag designs, and we can print your supplied artwork directly on the bag in the color or colors of your choosing. 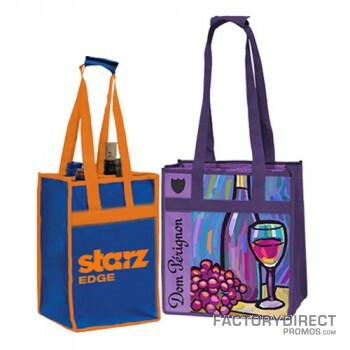 But, if you want to make your reusable wine bags custom to your marketing vision, we can do that, too. You can design your bag from the ground up. Choose the materials, size, handle length, add pockets, or zipper or snap closure. You could even make an insulated bag to help keep bottles at a specific temperature. When you order custom designed reusable wine bags that turnaround is longer, since the production process is more involved. It can take up to 8 weeks to receive your custom bags. It seems counterintuitive, but if you are looking for ways to keep your costs down you should consider increasing your order quantity. The more reusable wine bags you order, the lower the price per bag. As you order more bags the material costs will increase, but the amount of setup in generally about the same whether you order 500 bags or 1,500 bags. When you order a higher quantity you pay less per bag. This is why it really pays to order as many reusable wine bags as you think you will possibly need. If you were to run out and place a second order you would end up paying more than if you had ordered a larger quantity to start. In addition to offering a safe, easy, and comfortable way to carry wine bottles, reusable wine bags are also eco-friendly. A couple of factors make reusable wine bags an eco marketing tool. Simply by being reusable these bags reduce the need and use of single-use plastic bags. Disposable plastic bags are bad for the environment for a variety of reasons, but by utilizing reusable wine bags your brand can help turn things around. When reusable bags are made from eco materials, such as fabric made from recycled content, or sustainable fabrics, like jute, bamboo, or cotton, they are eco by again eliminating the need and use of nonrenewable resources. Consumer research shows that people want to do business with companies that demonstrate their care for the environment. When you market your winery with reusable wine bags you are securing a promotional item that delivers a great marketing value that also helps the planet; and shows your customers that your brand is serious about environmental causes. Find out how memorable your wine will become long after the bottle is empty. Contact us today for more information on creating unique, one-of-a-kind reusable wine bags that will market your winery with a great ROI. Next Next post: Buy Kraft Recycled Grocery Bags at Rock Bottom Pricing! Are Bag Bans The Best Solution to The Plastic Bag Problem? Why Not Recycle?